Here’s an international roundup of blogs focused on advertising and marketing. We’ve sorted the sites out by continent/region. As you can see we have a few gaps. Leave a comment or send us a note (editor @ theinspirationroom.com) to make suggestions about sites that should be in the list. Sites listed in bold have linked to The Inspiration Room Daily in their side bars or links pages. I’m adding Twitter addresses as an update – click on the “tw” links. 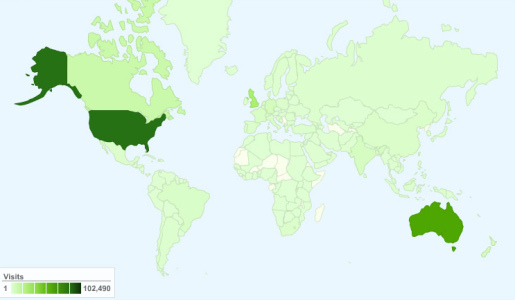 The image below indicates the spread of Inspiration Room readers from around the world.